In this piece "Ephemeral Creation" by contemporary artist Dougall, we see an abstract scene of Autumn represented by leaves. Like his other pieces representing this season of change, here we see a variety of leaves and their silhouettes composed in a scene which alternates form with blocks and spaces of color. The autumnal tones are represented here with the auburns and browns. This abstract piece of autumn represents the season of change and evolution is a time of year that is filled with change in nature that is quite dramatic. 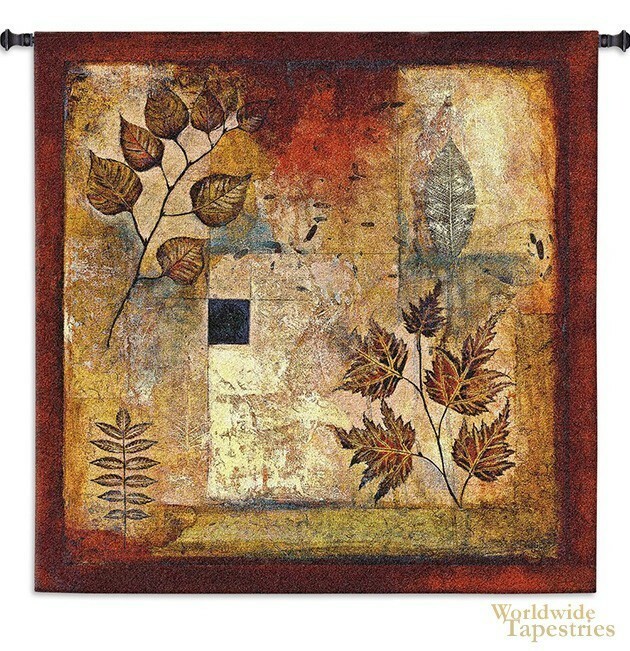 This tapestry "Ephemeral Creation" is backed with a lining and has a tunnel for easy hanging. Note: tapestry rod and tassels, where pictured, are purchased separately.